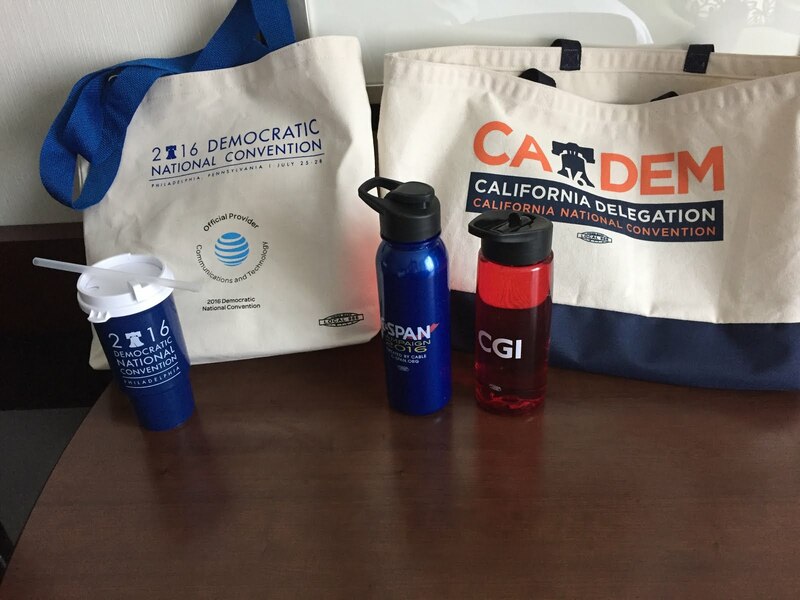 Pictured above is some of the "loot" provided to delegates when they check in to the Democratic National Convention. Today, Monday, is the start of the Convention, and today is the last time for delegates to check in. 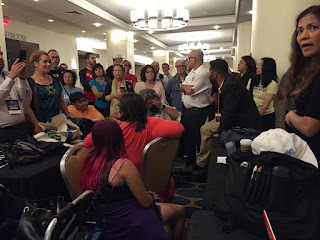 Most did yesterday, I among them, and those who showed up got lots of convention-related buttons, water bottles, toys, snacks, and the like. Delegates receive their official credentials to get into the Wells Fargo Center on a daily basis, and Monday morning is the first day that official credentials are being handed out. 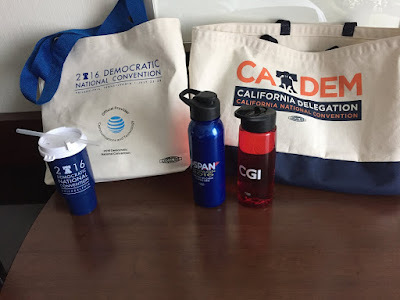 Since I am an "alternate" delegate for Bernie Sanders, I may get an upgrade if a Bernie delegate doesn't show up. As I indicated yesterday, I am using my Two Worlds blog, this week, to give readers a personal report, perhaps providing news or information that the major media isn't covering. In terms of what happened on Sunday, the Democratic Party is all about the "Party" thing. 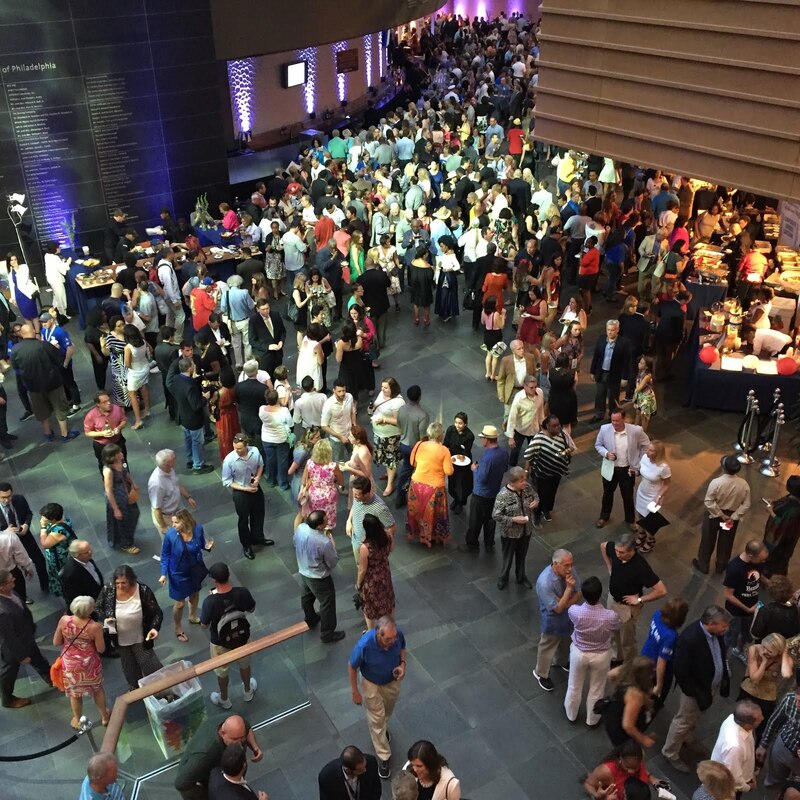 Here's a snapshot of the opening night celebration, for all Democratic delegates, held at the Kimmel Center. Spectacular. Gourmet food. Free beverages. Entertainment. Plus a chance to start the schmoozing! 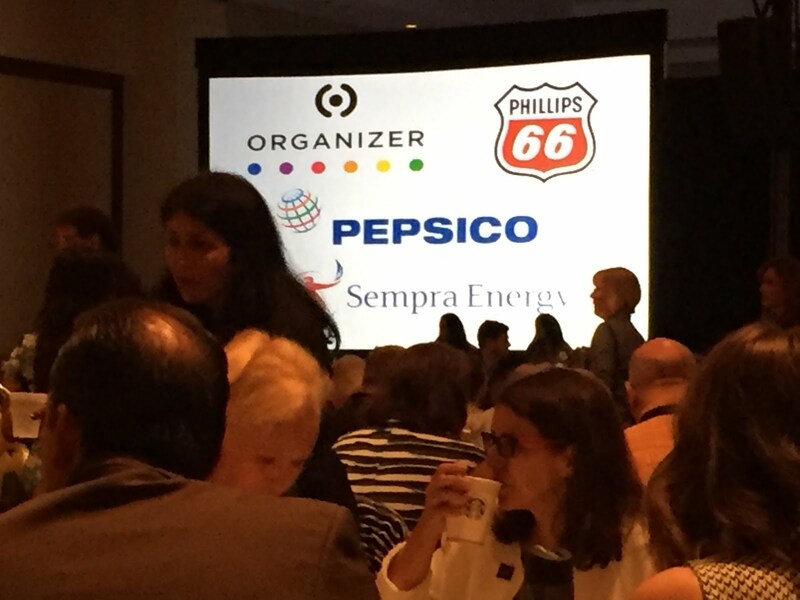 On Monday morning, a breakfast was held for the California Delegation. That delegation is being housed in the Philadelphia Downtown Marriott, at about $700/night, which means most delegates are sharing accommodations. I am rooming with Alan Haffa, a Monterey City Council Member and Bernie Delegate. 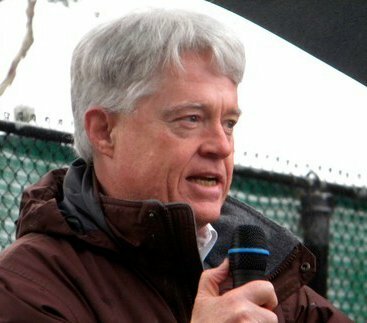 Alan is also a coordinator of Bernie Delegates from the Central Coast Region. The breakfast was unexpectedly raucous. Many Bernie Delegates booed or otherwise showed their dislike for Hillary Clinton, whenever her name was mentioned. San Francisco Mayor Ed Lee is not a favorite of progressives, and was attacked during his time at the podium. California Secretary of State Alex Padilla drew the most negativity, with chants from the floor of "Count Our Ballots," and "Do Your Job." Many Bernie Delegates truly believe that Bernie "won" the vote in California, and that ballot fraud was prevalent. The fact that the breakfast and the Convention was partly sponsored by oil companies, with that fact being advertised, probably put the more progressive delegates in a cranky mood, even before the speakers showed up to stir their ire. Nancy Pelosi was really the only major speaker who didn't draw down anti-Hillary Clinton reactions, laughing off an effort by one Bernie supporter to put a "Bernie Sanders For President" sign into the video screen with her. By the time she ended her terrific address, I felt like starting a chant, "Pelosi for President!" In my opinion, the problem that the Democratic Party has had with the Sanders' Delegates, right from the start, is that the official Party apparatus has acted as though Hillary was inevitably going to be the official candidate, thus sending the message that the actual "election" process was a sham. The revelations that led to the resignation of Debbie Wasserman Shultz, and to the rancor that has accompanied her appearance here in Philadelphia, show that this attitude was present from the start of the primary season, and it still persists. The Convention is organized in a way that "presumes" that Hillary Clinton is the Democratic Party candidate; however, Hillary has not yet been officially voted into that status, and doesn't have enough "pledged" delegates to claim the nomination. When the "Super Delegates" all vote, Hillary should, indeed, have more than the necessary numbers, if they vote for Hillary as they say they will, but until that happens, the theme of "Coming Together," which all the Party officials deployed, rings hollow in the ears of Bernie Delegates who want to vote for their candidate, and who truly believe that Bernie would have a much better chance than Hillary to defeat Donald Trump. 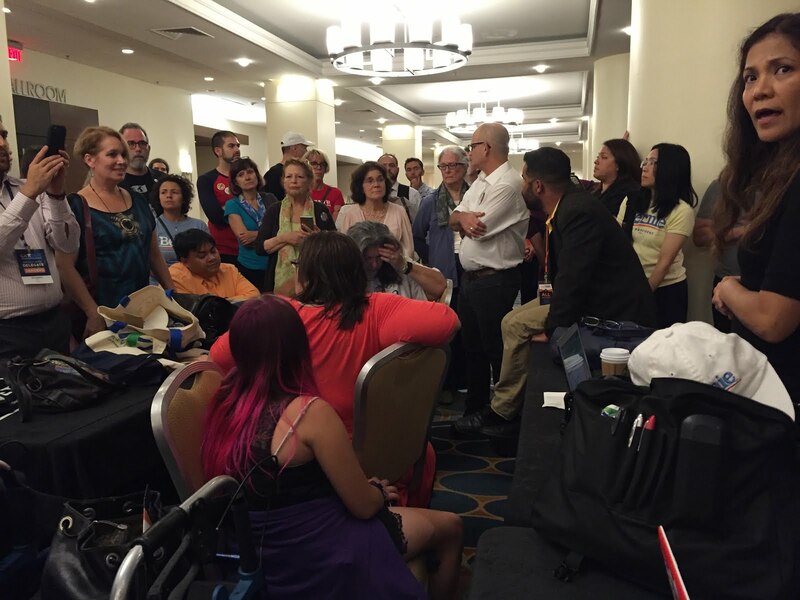 On Sunday evening, all the Bernie Delegates from California got together, and talked about how to communicate and coordinate as the Convention gets underway. Bernie Sanders has called a meeting for today, for all this pledged delegates, and there was a real debate about whether to go to that meeting, since many Bernie Delegates were afraid that the meeting was scheduled so late that they would miss the opening of the Convention, and that their absence might then allow adverse rulings to be made, without their objection and opposition. Bernie moved his meeting earlier, to eliminate that problem. Here's a shot of the crowd last night. I am finishing up this posting at about 11:00 o'clock in the morning, Philadelphia time. Tomorrow, I'll bring you up to date on what happened during the Convention's first day! Thanks for the informative update! Don't forget to tell us what you think! Fun to read an inside view, Gary. I'm a bit appalled though that delegates would have to spend so much for lodging to participate in a democratic process.